Apple on Sunday posted a new ad for the Apple TV, featuring soon-to-be-retired basketballer Kobe Bryant and actor Michael B. Jordan, best known for roles in movies like Creed and Fruitvale Station. 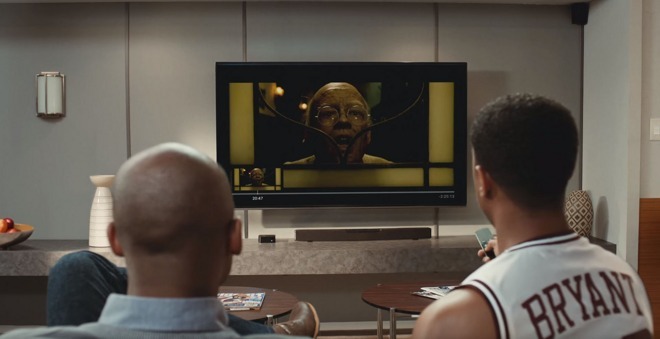 In the TV spot, Bryant and Jordan are sitting in a trailer discussing a fictional biopic, using Siri on the Apple TV to call up things like the NBA app or the David Fincher movie The Curious Case of Benjamin Button. Jordan's take on Bryant eventually leads to him being kicked out. Apple has been more aggressive in marketing the fourth-generation Apple TV, the first to feature both Siri and an iOS-style App Store. That includes not just TV commercials, but other mediums like billboards. Previous generations of the set-top were classified as a "hobby" by Apple, and not promoted very strongly. The new ad also reflects Apple's growing reliance on celebrities to manufacture a brand image. A recent Apple Music promo, for instance, featured pop superstar Taylor Swift.